Photos by Scovad/ getty images plus. Copper light fixtures in circular forms and nickel hardware aligned vertically supply contrast and balance. Flying in the face of a commandment in interior design that metals should never be mixed is the trend of going pedal to the metal in the opposite direction, mixing those materials in ways that give a space unique shine and contemporary style. There are a few rules of thumb to follow to achieve a look that is cohesive and not conflicted. Metal should be an accent, whether in décor or in fixtures, that creates visual interest as one of the four power points of design: color, pattern, texture and shine. Not that shine has to mean glisten. In fact, metals can be oil-rubbed, burnished or brushed to give them an aged look or a softer feel. It’s the tone of the metal that is most important, as it should tie into the color story you’re creating, whether that story is warm and inviting or cool and calming. “When you’re mixing metals in a space, choose tones that complement each other,” says Stephanie Schefano of Lovelace Interiors in Destin. “For instance, for a room with warm tones like red and brown, choose a warm metal like copper, gold or brass. Schefano, with six years of experience decorating some of the most luxurious homes in the area, has observed changes in the use of metals. “Combining metals is great because it creates depth and visual interest to a space and almost adds layers to the design,” says Donna Zambetti, independent design consultant and owner of D.Z.N.Y., based in Gulf Breeze. For 30-plus years in this industry, her work has taken her all over the country. “It’s important to realize, however, that when you want to add metals to a space, you should always take your cues from the tones of the room in selecting your primary metal. With that said, adding a contrasting metal as a pop to the primary tone of metals is a great effect, and I recommend doing it in three areas to keep the eye progressing throughout the space. Photos by olga prava / getty images plus. 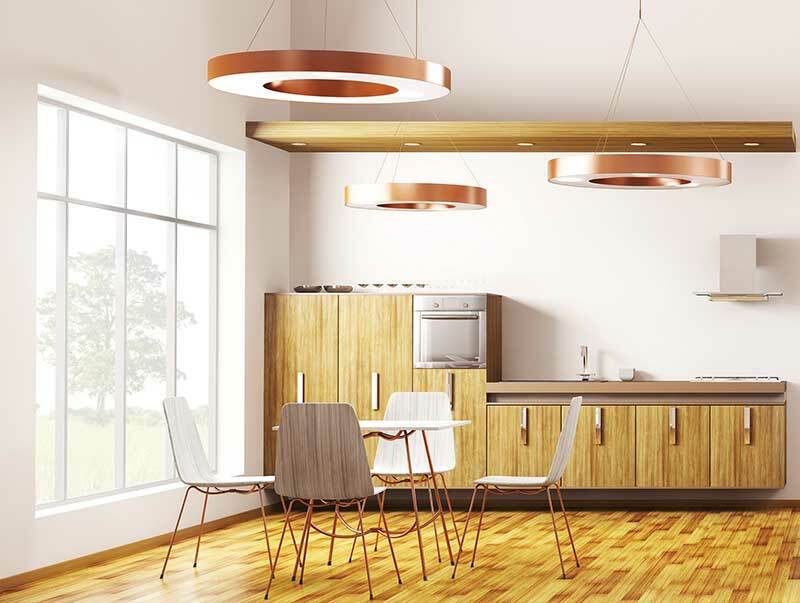 Polished copper pendant lamps radiate warmth and reflect surrounding light. Such a focus on metal in design is impacting the offerings of home accents, popping up in everything from lamps to wall art and even textiles. Metallic tones are no longer restricted to actual metals; so influential have they become that virtually nothing is off limits — and that makes the mixing all the more chic. “Using an eclectic mix of metals will really help you define your own style,” says Linda Mugglin, owner of Tassels Interiors in Panama City, whose 18 years as an interior designer has given her extensive knowledge of trends.